On any given day, SWE members can visit All Together to get the latest insights and information on women and STEM fields, as well as their fellow members and society programs. When you’re one of the biggest advocates and membership organizations for women in engineering and technology, you’re going to accumulate a lot of really good content. The trick is … how do you use that content? Furthermore, how do you use it to provide value to your current members while simultaneously reaching as wide an audience as possible? The Society of Women Engineers (SWE) partnered with David James Group to create and manage a comprehensive content marketing strategy that keeps members informed, engaged and allows SWE to maintain its position as a powerful voice in the industry. 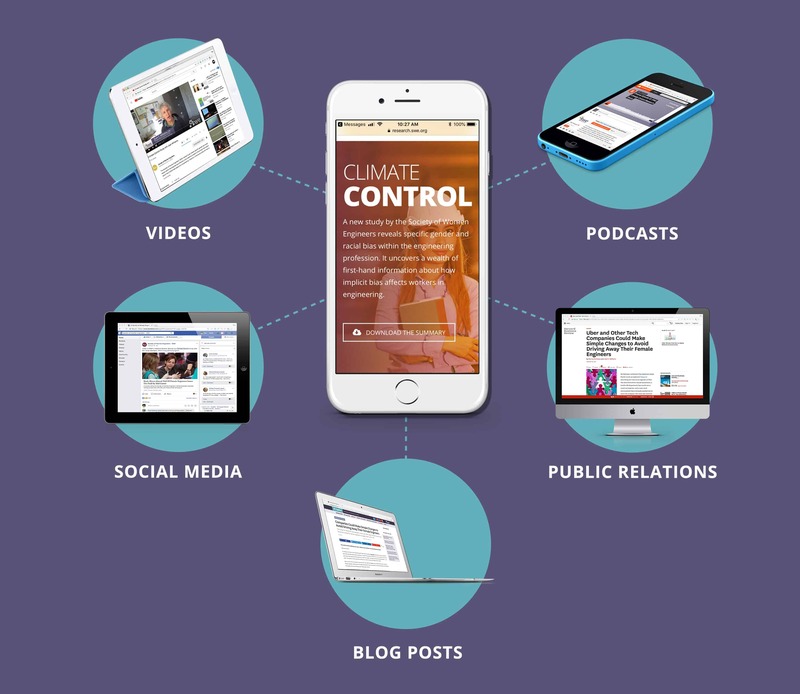 We took a multi-channel approach with blog content, PR, social media, video and podcasts, and housed it all under one roof – SWE’s newsroom, All Together. Each time a new content piece is produced, our marketing content team identifies how we can repurpose it across each platform to leverage as much organic reach as possible. On any given day, SWE members can visit All Together to get the latest insights and information on women and STEM fields, as well as their fellow members and society programs. We work with association members and headquarters staff to identify new opportunities for our content calendar and execute in a collaborative way. We put the focus on the member – highlighting member benefits and the members themselves while simultaneously keeping our audience abreast of the broader industry trends that matter to them. Creating an association newsroom requires a brand journalism approach with a member focus. SWE’s content marketing program is just that – a perfect combination of industry know-how, association content and member featured content that gives members a reason to keep SWE’s web content platforms bookmarked in their feeds. Email us or use our live chat feature below to learn more about how DJG can help you cause a stir with an integrated content marketing strategy.